Hello, interwebs! 👋 What’s fresh with an entirely different user experience? WooCommerce Checkout Add-ons version 2.0! 🍏 Let’s take a look through some of the changes in this major upgrade, and how it changes managing add-ons in your store. Version 2.0 doesn’t change much of what your customers will see, but it makes some big improvements in how you manage add-ons, as well as improvements in structure that make it friendlier to developers and customizations. First, we’ve adjusted add-on settings. WooCommerce 3.3 moved some of the checkout display settings to the WP Customizer to control checkout settings while you see the adjustments in real time. We’ve now moved our add-ons placement setting here, too, so you can see how adjustments to the settings influence add-on positioning at checkout. The rest of the admin experience is also completely redone. Previously, creating add-ons was done in a pretty simple list format. While this made it simple to add a set of add-ons, it was pretty difficult to create options or price adjustments for add-ons. We’ve rebuilt add-on management in version 2.0 to make this process much friendlier. You’ll still see a list of all add-ons under WooCommerce > Checkout Add-ons. However, now you’ll see only basic add-on data, and can click on an add-on to edit it. Quick pause before we move on: see the “Enabled” column? 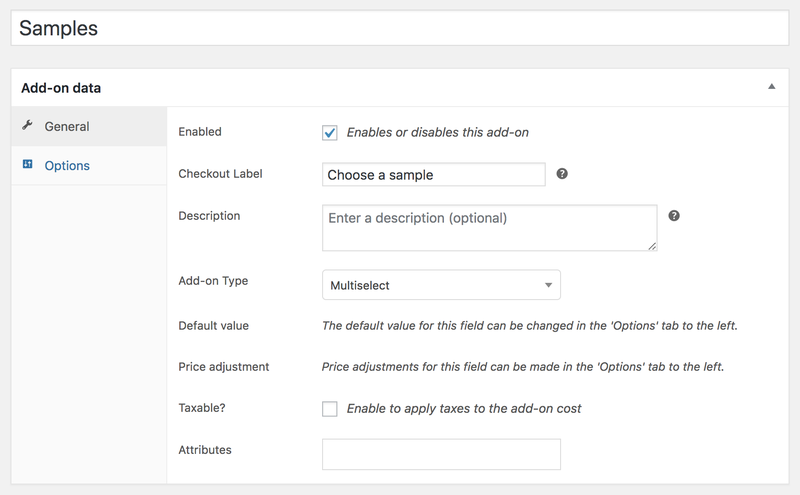 You can now create an add-on and enable or disable it to show it at checkout! This lets you show add-ons for a period of time and then disable them, rather than completely deleting the add-on. What else has changed? We’ve adjusted the add-on settings to allow you to enter a description for add-on fields in addition to the fields you’ve always had, such as labels. 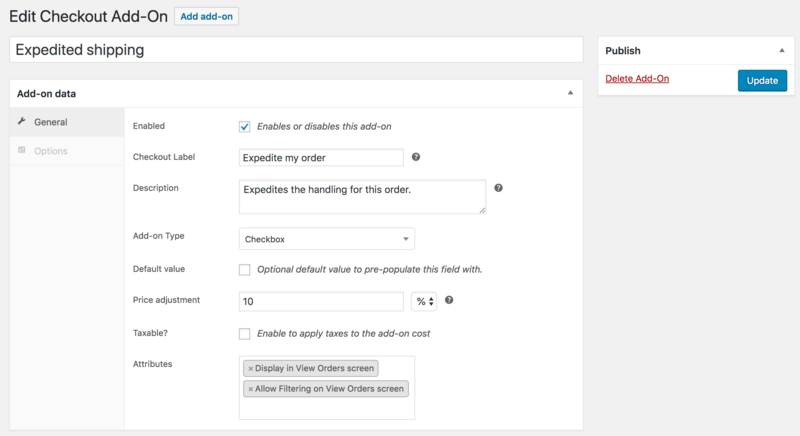 Descriptions will help you provide instructions or more details on how a particular add-on field will be used. No more! 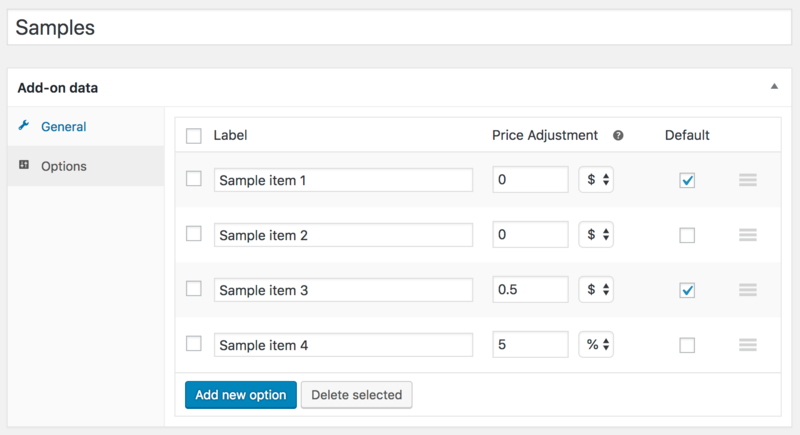 Now when you choose an add-on type that accepts options, you can add rows for each option. You can also more clearly define price adjustments (both positive and negative changes) depending on which add-on is selected, and configure default options for your add-on. This release is geared towards improving your experience in managing your add-ons, and improving the flexibility of the plugin under the hood. This paves the way for new features to manage add-ons, such as conditional display, so stay tuned for further changes! Jared is a PHP engineer at SkyVerge, focused on maintaining and building new features for our WooCommerce plugins. When he's not solving code puzzles, he solves real puzzles as a bonafide Rubik's cube master.